The 1973 Hallmarking Act was the culmination of a very lengthy and complex process involving over 30 statutes relating to hallmarking, some of which had been adjusted or partly repealed. Many included requirements inappropriate to the new economic and social situation. An overhaul of legislation was well overdue. Eventually the Hallmarking Act 1973 was passed, championed by Jerry Wiggin MP, a descendant of a Birmingham family associated with the Assay Office for generations. The new Act created the British Hallmarking Council, harmonised date letters, simplified gold standards and reinforced compulsory hallmarking for gold, silver and, for the first time, platinum. Nowhere else in the world are consumers more highly protected than in the UK. The UK is one of only a few countries in the world that have compulsory statutory hallmarking. This means that every item sold as precious metal, ie gold, silver, platinum or palladium must have been tested and hallmarked by an independent third-party Assay Office to guarantee that the precious metal is of the fineness stated. The law applies to everything SOLD in the UK , regardless of where it may have been manufactured. The only exemptions are items which fall beneath the specified weight thresholds which are 1 gram for gold, 7.78 grams for silver, 0.5 grams for platinum and 1 gram for palladium. This statute is reproduced with the kind permission of Westlaw UK. Please check available services to see if this statute has been amended. 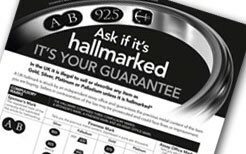 The Hallmarking Act 1973 has been regularly amended to embrace the needs of an ever changing fine jewellery market. The Hallmarking Act 1973 has been amended by Hallmarking (Exempted Articles) (Amendment) Order 1975, the Hallmarking (International Convention) Order 1976 (as amended), the Hallmarking (Exempted Articles) Orders 1982 and 1986 and the Hallmarking (Approved Hallmarks) Regulations 1986. Further changes to the legislation were made by the Hallmarking (Hallmarking Act Amendment) Regulations 1998 to bring the UK legislation in line with the rest of Europe. In 2002 the British Hallmarking Council granted permission for Assay Offices to operate sub offices within the facility of a host company. That could be a major importer, manufacturer or retailer. The benefits of a sub office are significant to large players as the saving in transport and administration saves both time and cost. Initially sub offices were only found in the largest companies but, since the recession of 2009, smaller companies who operate on a “just in time “ basis have found sub offices to be a huge competitive advantage as they can hold very little stock but still offer a fast service if they have a sub office within their own facility. Sub offices are strictly controlled and operated by Assay Office staff with very restricted entry for employees of the host company. The independence of the Assay Office operation must be protected at all times. Assay Office Birmingham opened its first sub office in 2003 and currently operates seven such facilities. Changes which came into force on April 6th 2007 to allow the marking of mixed metals offer consumers more accurate descriptions of the items they are purchasing. Previously the Hallmarking Act prevented hallmarking of items made of a mixture of precious and base metals, and the regulations for mixed precious metal items were very restricting. This resulted in misleading descriptions because if a precious metal item is not hallmarked then it cannot be described as such. Significant anomalies have arisen, particularly for expensive items such as 18ct Gold and Stainless Steel watches which have had to be described as “yellow metal” and stainless steel. The same piece of legislation included an amendment to hallmarking legislation in respect of items originally brought on to the market pre 1950. Before 1975, many precious metal articles (e.g. rings, whatever their weight, other than wedding rings) were exempted from hallmarking. Platinum was not hallmarked at all. Any article covered by these exemptions, if (a) of minimum fineness* (b) proved to have been manufactured before 1975, may still be described and sold as precious metal. The amendment means that even articles which should have been hallmarked when they were made, but bear no hallmark, are now treated as exempt if they were manufactured before a specific date. From 1999 to 2007, the threshold date was 1920, but the amended legislation altered this date to 1950. Therefore, any pre-1950 item may now be described and sold as precious metal, if the seller can prove that it is of minimum fineness and was manufactured before 1950. “The Hallmarking Act 1973 (Application to Palladium) Order 2009 (SI 2009/2040)” came into force on 22 July 2009 making it the fourth precious metal to be placed under hallmarking control. The ranking of precious metal now starts with platinum as the most valuable through gold, palladium and then silver. Palladium belongs to the family of platinum group metals but is considerably less dense than platinum, and so an article made from Palladium will weigh significantly less than a visually identical one made from Platinum. Hallmarking of palladium was voluntary from July 2009 until January 2010 when it became compulsory for all palladium pieces weighing over 1 gram. A Legislative Reform Order (LRO) came into law on 8th February 2013 after a significant period of debate. The LRO gives UK Assay Offices the legal right to strike hallmarks outside of UK territory. This change was driven by the Assay Offices who were seeing large volumes of work lost to other national hallmarking bodies who had no restriction on where in the world they could operate. They were therefore able to apply hallmarks in sub offices in the country of supply. This was a major commercial disadvantage with over 80% of precious metal items sold in the UK now being manufactured outside the UK. The Assay Offices can now operate on a “level playing field”, competing with some of their overseas counterparts who have had the ability for many years to open and operate overseas sub-offices. The same Legislative Reform Order also changed the requirements for sponsor marks, allowing logos to be used for the first time, as long as they provide the required traceability. From time to time the British Hallmarking Council issues Guidance Notes on specific areas which may be causing concern. These have no legal standing but are intended to maintain the level playing field which the Hallmarking Act 1973 strives to deliver. Click on the Guidance Notes on the left for a practical guide to the Hallmarking Act 1973 and subsequent amendments. No reliance must be placed on the document for a legal interpretation. Assay Birmingham Office will be happy to answer questions arising from these Guidance Notes and on any articles or other issues not specifically mentioned.